Both sirloin and fillet separated by a ‘T’ bone. A fantastically sized piece of beef for two to share. The Porterhouse is a composite steak coming from the point where the tenderloin and top loin meet. Basically, an over-sized T-Bone steak the porterhouse is generally cut thicker and has much more of the tenderloin relative to the loin portion. If you remove the bone and cut out the two steaks that make up the porterhouse you will get a tenderloin steak and a top loin (or New York Strip Steak). So if you are ordering a Porterhouse, I hope you’re hungry. A good porterhouse is also the perfect steak for two people to share. 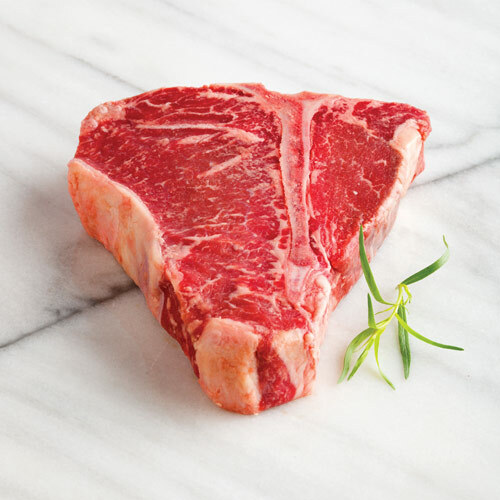 When buying a porterhouse steak, look for one cut at least 3/4-inch thick with 1-inch thickness being ideal.